Today I went for a swim. It’s been a really hot, sunny day, and I thought I’d best make the most of this small window of weather that is calm enough. Although I love swimming and am usually one of the first to leap into icy lakes and stormy seas, it did take me a little time to work up to leaving the relative safety of Darien’s deck to plunge into the deep blue. I had a good look around for fins and for anything else that might have made for a less enjoyable swim, and took courage from the little fish that still swarm about – if there was nothing to worry them I guessed I’d be fine. I made sure I was attached to my lifeline land slid into the water. It was cool and clear, but what struck me most was how strange it was to be looking up at Darien, lying empty without me. As far as I could see in every direction, the only things visible on the surface of the water were me and Darien, and it felt quite uncomfortable to be separated from each other with nothing else around and the seemingly endless depths beneath. Quite a few people have been asking me about what rubbish I’ve seen while I’ve been out here. Although I’m more concerned about ‘invisible’ litter (microplastics), I’ve also been keeping a sharp eye out for anything that shouldn’t be floating about in the ocean. I think on average I’ve seen something about every three days – from what seem to be old buoys come adrift, to plastic bottles, to strange shapes I couldn’t identify. 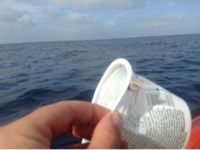 Usually they’ve been too far away, or it’s been too rough, but yesterday I was able to scoop an old plastic pot out of the water. The writing on it was fading, and instead it had started to become a home for tiny sea creatures. 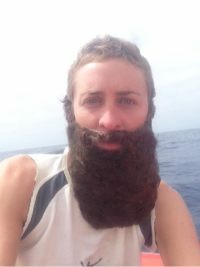 Finally, from what I remember of a lot of the ocean rows and expeditions that I’ve followed, one of the requirements is to arrive back home with a large and grizzled beard. I thought I’d probably better get into the spirit of such things, and have managed to produce what I consider to be a particularly impressive specimen (although I can’t promise I’ll come home with it!). Must have felt extremely strange to be separated from Darien, but having a refreshing dip must have been wonderful. The beard really made me laugh outloud. What is it made of I wonder? I’m close to donating some Orr stroked but can’t quite figure out your landfall destination. Hey IpiJim, destination TBC, watch this space!! Glad to hear you were able to have a swim and everything went well. That’s quite an amazing beard. Please let us know what its made of. Did you bring it with you? LOL Are you getting closer to your destination? There was a picture of Brodie on Facebook yesterday. He had found sail jellyfish. I had never seen one. Stay safe Elsa and I hope you find your landing spot soon! …good to see things are calm and you can have some fun!……enjoy the peace and serenity,,it sounds like you’ll be back on terra soon! Oh Elsa…I am so glad you have retained your sense of humour and got to have a swim. We swim at least once a day here in Bahia Asuncion and look forward to treading some water with you we hope. The beard becomes you missy! Hope to see you soon. Hilarious! I LOVE you Elsa. And quite fancy you looking like a sea-dog! 😉 You wear it well! Reading about your swim in the deep sea made my chest go tight just reading about it … Your braveness is an inspiration and I’m so glad you did go in. Hurrah! I received my mile 27 certificate dedicated by J Arthur just after I had given a craftsman a photographic documentary of his boatbuilding skills. He loved it. Your challenge and J’s dedication inspired me to do it. Doing the best one can gives a fantastic feeling of achievement. Well done Elsa. So glad you liked it, and well done on the photographic documentary – I completely agree!